LEXINGTON, Ky. (October 23, 2018) – The National Stem Cell Foundation (NSCF), Summit for Stem Cell Foundation, The New York Stem Cell Foundation (NYSCF) Research Institute, and Space Tango today announced a bi-coastal research collaboration to study Parkinson’s disease (PD) and primary progressive multiple sclerosis (PPMS) in microgravity. For the first time, cells from patients with PD and PPMS will be sent to the International Space Station (ISS) for a unique opportunity to observe cell-to-cell interactions in neurodegenerative disease when the gravitational forces that act on cells are removed. Research teams at the Summit for Stem Cell labs in La Jolla, California, and the New York Stem Cell Foundation Research Institute in New York, NY, will conduct the first long-term cell culture experiment in space focused on neurodegenerative diseases. Specifically, the project is developing advanced human cellular models of these diseases based on induced pluripotent stem cells (iPSCs) derived from patients with PD and PPMS. Working across institutions and disciplines, the research teams will convert the iPSCs into different brain cell types and 3D aggregates of these cells called organoids. Working across institutions and disciplines, the research teams will convert the iPSCs into different brain cell types and 3D aggregates of these cells called organoids. Notably, these organoids will also incorporate microglia, the immune cells of the brain, derived from patient iPSCs using a protocol developed by NYSCF. Microglia play an important role in mediating inflammation via migration towards damaged areas of the brain that has recently been implicated in the pathogenesis of PD, MS, and several neurodegenerative diseases. These 3D human brain models are making an unprecedented journey to the International Space Station to study the effects of microgravity on organoid assembly and microglia migration during neuroinflammation. The hardware engineering required to facilitate the transport and survival of the cells to the ISS is being led by space research partner Space Tango. A pilot launch to test the hardware alone will go up this fall, with a full launch to the International Space Station (ISS) from Cape Canaveral in May. The project is funded by NSCF. “We are proud to be working with a great team of scientists and fantastic organizations with the goal of learning more about neurodegenerative disease,” said Dr. Andres Bratt-Leal, Director of Research & Development, Parkinson’s Project at the Summit for Stem Cell Foundation. “This is a unique opportunity to study the behavior of neural cells under zero gravity. I’m excited about the project and look forward to learning the results of the experiment,” said Dr. Jeanne Loring, Senior Science Advisor, Summit for Stem Cell Foundation. 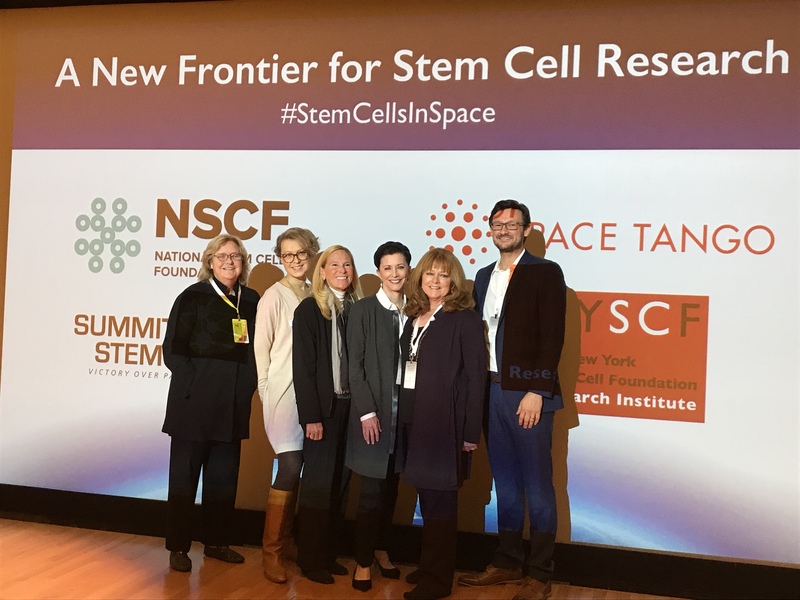 (Left to right) Dr. Jeanne Loring, Dr. Valentina Fossati, Space Tango Director of Commercial Innovation Jana Stoudemire, NSCF CEO Dr. Paula Grisanti, Summit for Stem Cell Foundation President Jenifer Raub, and Dr. Andres Bratt-Leal at the 2018 NYSCF Conference in New York, New York after announcing the ‘Stem Cells in Space’ collaboration. The National Stem Cell Foundation is a 501(c)3 non-profit organization that funds adult stem cell and regenerative medicine research, connects children with limited resources to clinical trials for rare diseases and underwrites the National STEM Scholar Program for middle school science teachers inspiring the next generation of STEM (science, technology, engineering and math) pioneers nationwide. For more information, visit https://nationalstemcellfoundation.org/. Summit for Stem Cell Foundation’s mission is to increase awareness, educate and raise funds in support of research working toward a patient-specific neuron replacement therapy for Parkinson’s that will result in a victory over Parkinson’s disease. Summit was founded in 2011 as a grass-roots, patient-based organization and has grown to reach patients all over the world. For more information, visit www.SummitforStemCell.org. The New York Stem Cell Foundation Research Institute is an independent organization accelerating cures and better treatments for patients through stem cell research. The NYSCF global community includes over 165 researchers at leading institutions worldwide, including NYSCF – Druckenmiller Fellows, NYSCF – Robertson Investigators, NYSCF – Robertson Stem Cell Prize Recipients, and NYSCF Research Institute scientists and engineers. The NYSCF Research Institute is an acknowledged world leader in stem cell research and in developing pioneering stem cell technologies, including the NYSCF Global Stem Cell Array™ and in enabling large-scale stem cell research for scientists around the globe. NYSCF focuses on translational research in a model designed to overcome the barriers that slow discovery and replace silos with collaboration. For more information, visit http://www.nyscf.org.